Here is a list of Best Free Online Contract Management Websites. These free contract management websites let you manage your contracts easily. These have various features, like: save contracts on cloud storage centrally, and can be managed/viewed by users or administrators, and also users can be added or deleted by administrators, email alerts when contracts are about to expire. Contract documents can be downloaded from anywhere. Most of these websites have both free as well as paid versions, and you are allowed to manage a limited number of contracts in the free versions. In my opinion avaima.com is a good website for managing contracts online as its interface is very simple and easy to understand. You can also try these best free Money Management software, Project Management software, and Inventory Management Software. Avaima.com is a web application that provides lot of business applications that you can run in the cloud. One of the application it provide is for Contract Management. 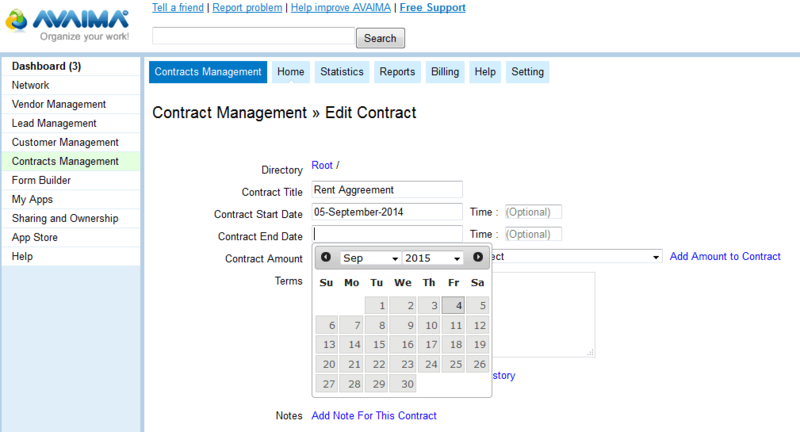 The free Contract Management module lets you manage up to 10 contracts. You can add a contract, and get email alerts about the contract. It also maintains history of the contracts. It is a pretty basic free contract management application that lets you store basic details about your contracts. To get started with this, create a free account with this website, and then add application of Contract Management. After that, start adding contracts. While adding contracts, it lets you set contract start date, contract end date, terms of contract, contract currency, user, witness email, etc. Based on the dates you enter, it will send you email alerts before the contract expires. It also comes with easy reporting features that let you see a complete summary of the contracts, along with their expiration date. It also comes with easy search that lets you search for contracts based on renewal / expiration date. 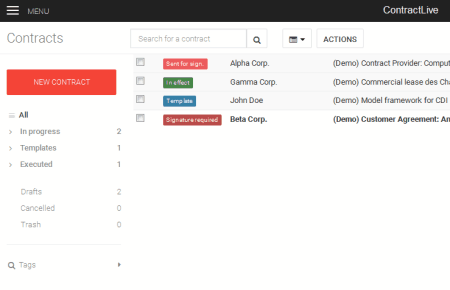 In addition to that, it also lets you organize your contracts in different categories. As I mentioned, it is a basic contract management service, so it does not have more advanced features, like separate access control for each contract, store more information about the contracts, or e-signatures. Most importantly, I wasn't able to find any option to upload contracts. So, if you just need a basic free online contract management solution, you can use this, otherwise there are better options in this list that you can try. cloudtract.com (Cloudtract Contract Management) is a free and easy to use online contract management software solution. The best part of this website is that it is completely free, and lets you add unlimited number of contracts. It is actually a pretty decent solution to manage your contracts online. You can create contracts, and even upload their corresponding digital documents (up to 10 files can be uploaded per contract). It alerts you when your contracts are about to expire. It is cloud-based and offers contract alert, administration features and a storage platform. To use it, first create a free account and then fill your details of contracts. 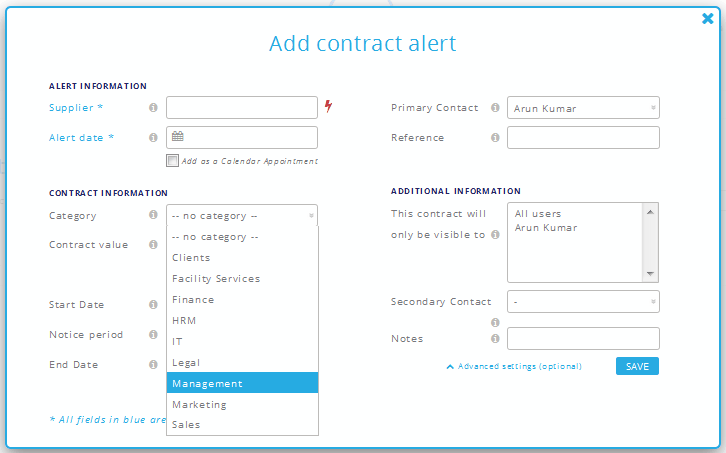 You can add additional contract details like contract category, contract value, start date, end date, notice period etc. As a security feature, you can set users to whom the contract is visible. 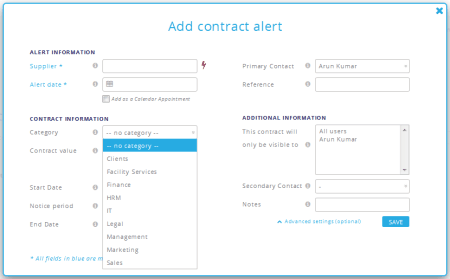 So, even though you can setup multiple users in your account, you can control visibility of each contract individually. Also, all the data between your PC and Cloudtract server is encrypted, which is almost an essential feature if you have important and confidential contracts. Various types of settings can be applied, for e.g. users can be added or deleted as per requirement. contract-live.com (Contract Live) is another free online contract management website. It has both free as well as paid versions, but the free version is also good enough. Free version lets you add up to 5 contracts. Now, even though this might seem like a pretty small number, but there are some compelling features that this contract management website has. First of all, it lets you digitally sign contracts. You can add all the parties that are involved in a contract, and it will get digital signatures from all of them. Secondly, it lets you collaborate on the contracts online. So, you can work with different people on a contract together. This takes away the need to send the contract to and forth on email to finalize it. Additionally, it maintains different version of the contract, lets you add contracts in different categories, provide status of the contract (draft, executed, etc.). 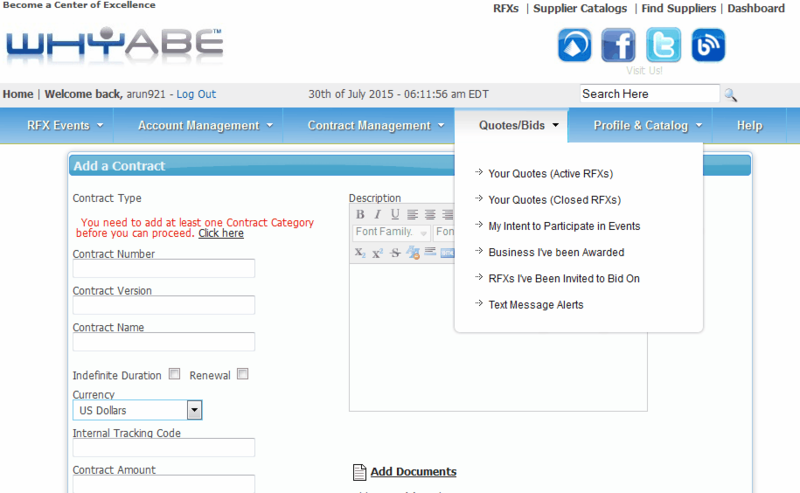 And of course, it comes with traditional features like email alerts for contracts. All in all, it is a pretty nice solution to manage contracts online for free. Only limitation is the 5 contracts in free version. whyabe.com is actually a full fledged free e-sourcing system. One of its module is free online contract management. In that, it provides two types of user accounts: For Buyers and For Suppliers. First you have to create a free account. You can upload multiple contract documents for the same contract. You can add description, auto renew terms, and commitment notes to the contract. You can easily manage your contracts by using this website. It also has an email alert service for expiring contracts. The interface of the website is simple and easy to understand. 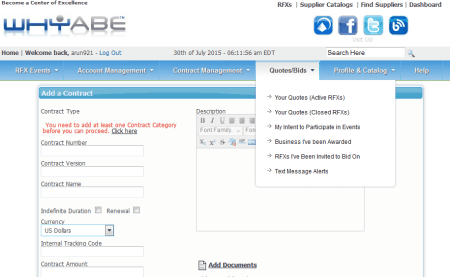 This website provides many other modules like Account Management, Quotes/Bids, RFX Events etc.